Towing the camper or boat up to the campground or lake for the weekend is a fun time for the whole family that will make memories to last a lifetime. We here at Serramonte Ford want to ensure that you are being as safe as possible when towing and that is why we would like to share a few basic safety tips. First, ensure that you give yourself plenty of time to brake when towing. You will need far more time to slow down when hauling additional weight. 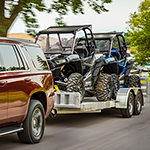 Second, ensure that the weight you are towing is as evenly distributed as possible. If it isn't you may find difficulty in turning corners. If you have any additional questions or would like to schedule a service inspection, then be sure to either give us a call or stop on by to see us at Serramonte Ford located right here in Colma today!